Rock legends Killing Joke have just released a career-spanning compilation - 'The Singles collection 1979-2012', which as the self-explanatory title should tell you consists of the singles they've released over the last 33 years. The band recently played shows in London and at Hammerfest, and are apparently recording a new album due for release next year on Spinefarm. The band have influenced numerous other bands, and their sound has evolved over the years including punk as well as rock, and even disco influences (check out 'European super state' as an example of a disco influenced song). 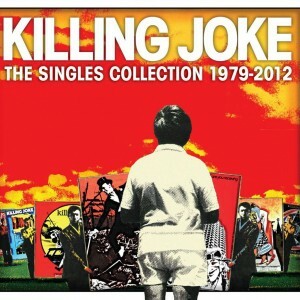 'The Singles Collection 1979-2012' is being released in 3 formats - Download, CD & Super Deluxe Edition. The Super Deluxe edition is impressive (and expensive - but understandably so). It's very limited and comes in a 'cigar box' containing 33xCD singles plus selected B-sides, expanded ‘Rarities’ disc, perfect-bound book including 5,000 word essay, poster, cigar tube and more. The CD version is available initially as a limited 3 CD package, and once that sells out then it will only be available as a 2 CD album. For this review I'm looking at the 3CD version. The first two discs contain the album itself and contains 33 tracks that were released as singles over the 33 year period covered by this release. Judging by the number of people who before the recent appearance at Hammerfest were asking about what album to listen to first to get an idea of what to expect, there are lots of rock and metal fans who while they may be aware of the band, have never really listened to them. For those people this album is a perfect introduction to the band - it's pretty much a "best of" release, so is a great place to start. I must admit that before Hammerfest I'd only heard a couple of their songs, so having thoroughly enjoyed their performance then was looking for an album of theirs to listen to, and this one fits the bill perfectly. For the band's existing fan base the 3rd disc is going to be of particular interest. There are ten tracks here, including some previously unreleased tracks, alternative versions of tracks that have been released, and tracks from albums such as soundtracks, so really it's ten tracks that most fans won't have in their collections already. If you're listening to Killing Joke for the first time with this album then it's definitely one that you'll enjoy on the first listen, but will enjoy more on subsequent listens as there is so much depth here. It's also fascinating to listen how the band's sound has evolved over time. With 2 CDs and 33 tracks, the normal version of the album is good value, but the limited edition version with 3 CDs and 43 tracks is even better, and is well worth picking up quickly before it sells out. A great album for both new and existing fans.